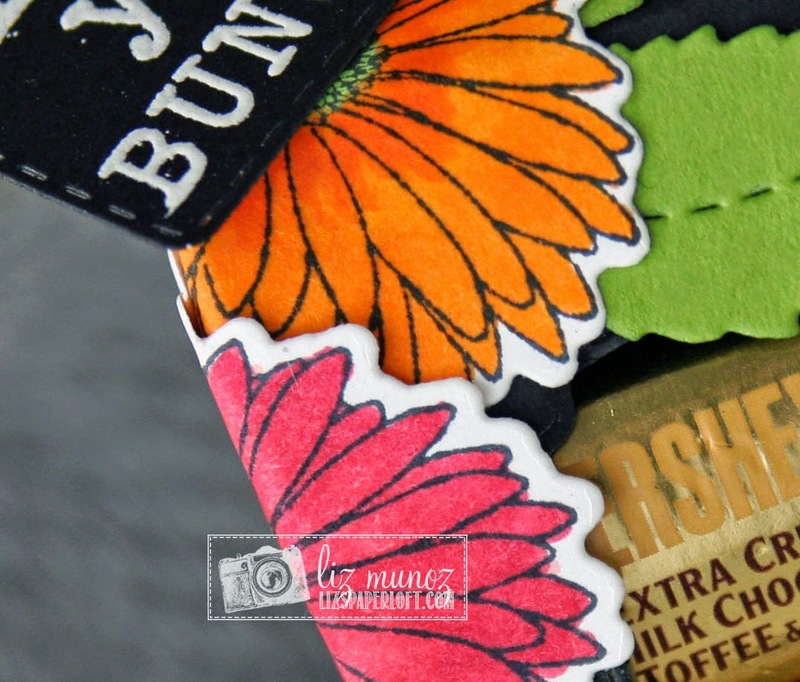 Liz's Paper Loft: MCT March Release Blog Hop ~ love you bunches! My Creative Time! You should have arrived here from the talented Miss Kim. If you just happened to pop in to see me, be sure to head over to our fearless leader Miss Emma! Since I was under the weather today, I had lost track of the amount for the FREEBIE stamp :( Usually by noon the 150th shopper comes through, but since I lost track, I decided to give this freebie stamp to everyone who placed their order today (3/20/2015)! The last order came through tonight at 9:03pm PST & that invoice number was #15550! If you missed out on this freebie, no worries because it is available for purchase HERE! For our "Freebie" stamp for this release, we are giving away this ADORABLE stamp "Every Little Thing…" to the FIRST 150 shoppers! You do NOT have to add it in your cart, Emma & her shipping crew will automatically include it in your pkg, ONLY to the first 150 shoppers! IF you happen to come through AFTER the 150th shopper, no worries because this stamp will be available for sale! Cute Cute treat box! Thanks for all your ideas this week. Good Job! Liz, love how you decorated the milk carton. Thank you for sharing your talent. Love the bold colors on your treat box. 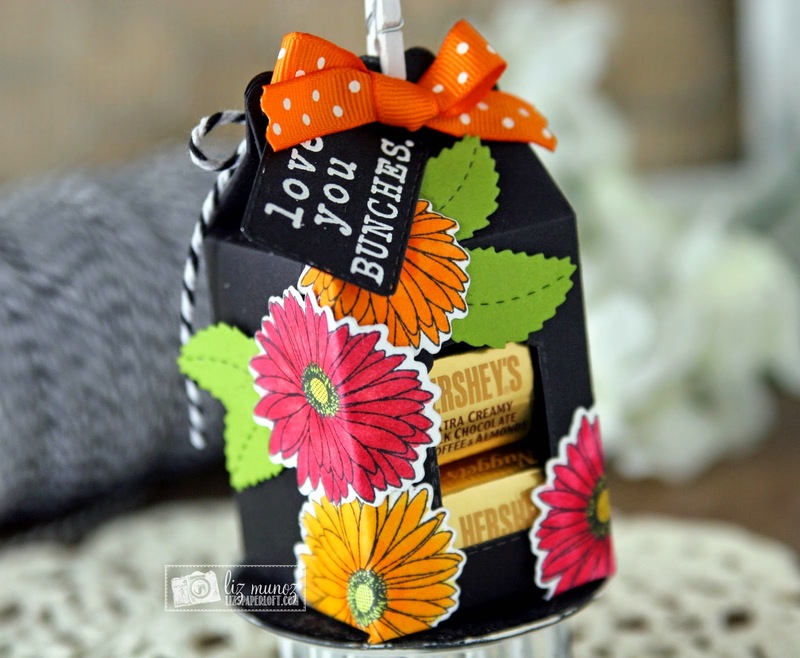 I love how the treat box is black so that the flowers really pop and with such bright colors! Liz ~ Oh my word ~ how CLEVER and BEAUTIFUL is this! I LOVE the whole concept!!! The colors are so vibrant and happy! Then wrapping the flowers around like that !~ EEK! BEAUTIFULLY done all week! OMG Miss Liz talk about a Stunning and Shabby/Chic treat box Girl you are just brilliant with how you use Miss Emma's goodies OMG Love .... LOVE!! Love the bright flowers on top of the black box. So fun! What a cute project...anything with chocolate is a good thing...LOL. Liz, Oh my goodness! 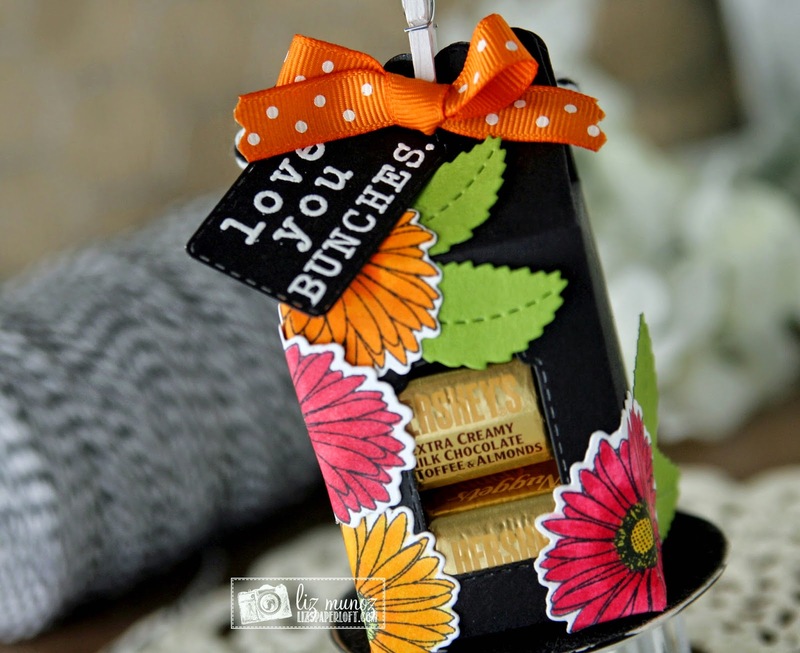 what a neat idea...wrap milk carton box with flowers....love it! colors are perfect. OH WOW!!! Your treat box is sooooo Beautiful!! I love the way you used the flowers and wrapped them on the carton. Great idea and I am also glad there are more labels and tags. They are fabulous. Wonderful job on your beautiful carton. Your treat box is fabulous! Your treat box is just beautiful. The colors really pop against the black and the flowers are gorgeous. I love the bright colors on this treat box-great job! Very cute treat box. I love these little tags. So cute. OK, you have sold me on the Love you Bunches stamp and die set! Your treat box is fabulous!!! I would have never thought to use the flowers like that! What a gorgeous box this is!! The flowers look amazing!! 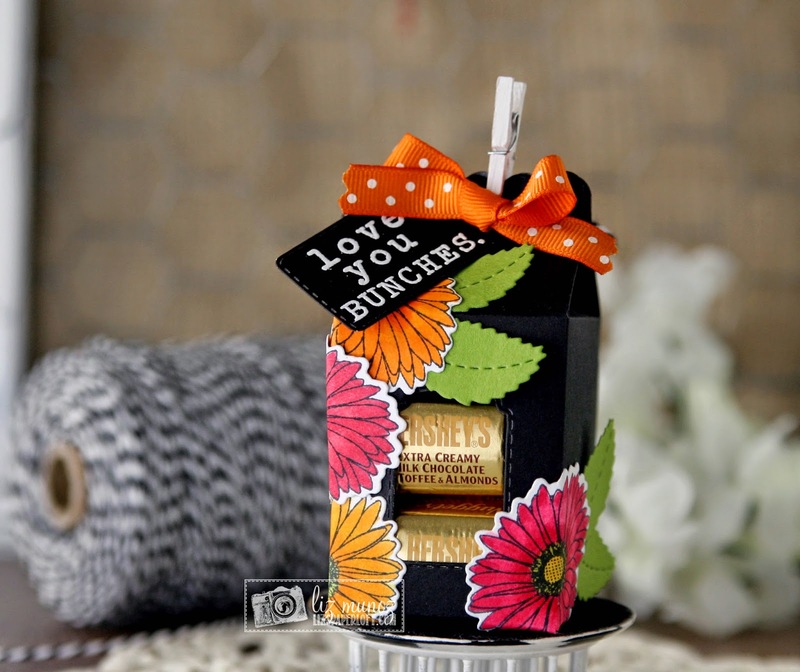 A fun idea to wrap the flowers around the corners of the box. I absolutely love your project! Such beautiful colors, so cheerful!!! Very pretty and colorful. I like the way the flowers wrap around. Your treat boxes are really pretty. I love the gerber daisies. The colors on the black really pop. WOW! Stunning, Creative and so Beautiful! I love the bright flowers against the black milk carton. Great project. I love the milk carton for treats and treasures. Good job. Love those bright colors on the black. Very striking! So cute...love the pops of color on the black. Love the gift carton with the flowers bod colors! Beautiful! How cute. Love this idea of wrapping the flower heads around a box. Cutest milk carton ever! Love the flowers wrapped around it! Way to think out of the box (or milk carton)! So bright and springy! Love it! What an awesome treat box! Love that you chose black as the base...it really makes all of the other elements pop! What an awesome treat box! I just love the black box with those gorgeous bright colors!! OMGosh I loVe how you decorated up your treat carton. So cute. Thanks for sharing. Really neat treat box! Great idea! Beautiful stamps set!! !Thanks for chance to win! Absolutely gorgeous, love how you did the flowers. I love your little Milk carton Treat box TFS its so pretty!!!! Oh WOW,Liz!! I adore this treat box!!! WOW! Love how you've used the flowers and how the colors pop against the black!! LOVE it!! Liz, the flowers really stand out like this. Awesome showcase all week.